When it comes to buying or selling a business, there are a lot of tax implications that you may not have initially considered. While one component of buying or selling a business often includes some form of business valuation — which means finding the actual price for the transaction — there are a number of additional components that may warrant help from your local Fort Collins CPA firm. At O’Dell & Company, we don’t pretend to have all the answers when it comes to providing business valuation services. However, we are more than competent when it comes to helping with all of the other nuances of each business transaction, from determining the proper structure for the deal to helping with the tax reporting for both the buyer and seller. The overall scope of buying or selling a business involves a whole lot more than just the valuation work. Keep reading to learn more about business transactions and tax help and contact an experienced Fort Collins CPA firm today to get started. The first thing to consider with any business transaction is the structure of the deal as a whole. Determining which of these is right for your situation will go a long way towards understanding the tax implications behind your decision. On the subject of tax implications, it’s important to realize that there are both positive and negative ramifications for each type of business transaction structure. These tax implications can impact both the buyer and the seller in different ways, which is why it’s imperative that you know how to make the right choice to save money and headache. Our Fort Collins CPA firm provides business consulting services for these very matters. If you’re in the process of acquiring a business through an asset purchase, it’s also vital that you consider which type of entity you want this new business to fall under. As the buyer, you will be forming a new entity, which means you get the opportunity to structure the business in a way that is suitable to your needs. It’s important that you consider the pros and cons of each entity choice such as an LLC, a partnership, an S-corp, and so on. How is this transaction going to be financed? This is another important question to ask before you enter into any purchase/sale transaction. A few factors to consider include the mix between debt and equity financing, outside bank financing vs. seller carry debt, and the related terms of the debt arrangement. Allocating the purchase price between tangible and intangible assets, for example, along with the recovery of the buyer’s purchase price and amortization deductions, can all cary important tax implications that you may not have initially considered. That’s why it’s important to have a knowledgeable CPA to help with the transaction details. After all this, both the buyer and the seller still have to file the requisite accounting and tax reporting for the transaction. Accuracy of the tax filing and reporting is critical to the success of the transaction, which is another important reason why you need the help of an expert. 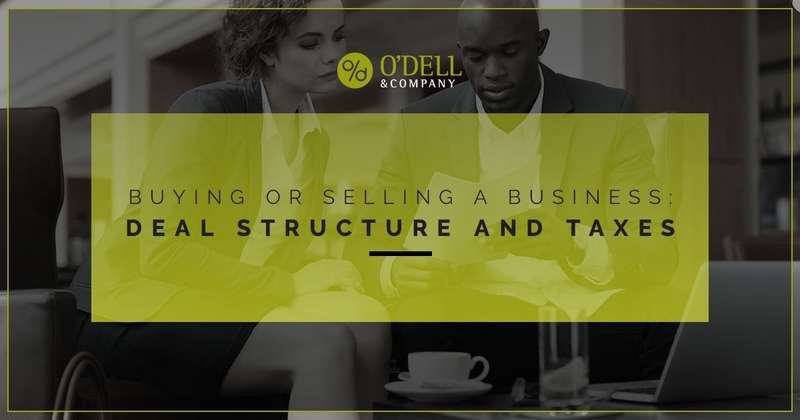 When it comes to business purchase and sale transactions, O’Dell & Company has the tools, resources, and knowledge necessary to help. Whether you need help with entity choice, understanding tax obligations, or you simply need help filing your small business taxes, we’re here to ease the burden. Contact O’Dell & Company in Fort Collins today to get started.